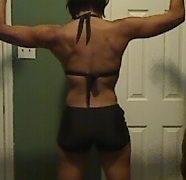 The two areas of my body where I have seen the most results from my P90X workout, would have to be my back and biceps. Appropriately named, the P90X workout that has allowed me to achieve such phenomenal results is called, "Back and Bicpes". The program begins with a cardio warm-up and stretch routine. The stretches are referred to as "Ballistic Stretches" or passive stretching using the weight of your body and gravity. Shakers, huggers, and reachers are examples of ballistic stretching exercises used in the P90X Back and Bicep workout routine. There are several P90X workout routines in Back and Bicep that are specifically bicep exercises. Each exercise is supposed to be performed so that the last three repetitions are hard, so you'll want to use a weight that you think will challenge you enough to max out on the last three reps. I started in round one with a light resistance band and five pound weights. By the second round I was using a medium band and 15 pound weights. Whatever weight or resistance you use, as long as the last three reps are difficult, you're maximizing your results. Note: listen to your body. Do not hurt yourself by picking a weight that's too heavy. If during the bicep exercises you realize the weight you have is too heavy. Stop put it down and start over with a smaller weight. Bottom line, it's hard (smile). No using beating around the bush. There's a lot of pushing and pulling. If you're using the right size weight or band and maxing out the last three reps as suggested, you're really going to feel the burn during the workout (not to be confused with over doing it and injuring yourself- listen to your body). 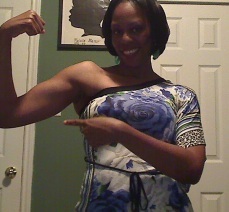 A day or so after the workout I have muscle soreness in my arms and a little bit in my back. Be sure to drink some type of recovery drink after your workout to replenish, feed those muscles you just exhausted, and minimize soreness. What kind is really up to you. I've tried Muscle Milk (yucky taste), low fat chocolate milk with wehy protein mixed in (not bad), and of course the P90X Recovery Drink . My staple is the P90X recovery drink and my fall back is low fat chocolate milk mixed with whey protein powder . Now go build yourself some beautiful biceps! Read More About P90X . I value your feedback. Send me your questions and comments. Be blessed!